More details on the Blackphone were released this morning, as it has been announced that the privacy-optimized smartphone will be powered by an NVIDIA Tegra 4i processor and i500 LTE modem. To this point, there was no exact word on which SoC would be used on the device, and it is almost a shocker to hear that it will be an NVIDIA chip; not that it’s a bad thing. In the press release, Blackphone gave a quick blurb about the Tegra 4i chip’s ability to meet the unique specifications and demanding performance requirements. With competitive focus centered on uncompromising privacy and user control, Blackphone’s selection of Tegra 4i acknowledges NVIDIA’s ability to meet unique device specifications and demanding performance requirements. Together with other world-class components and materials, Tegra 4i helps deliver on Blackphone’s promise of eliminating prior generations’ trade-offs and compromises between private, encrypted communications’ usability, accessibility and performance. 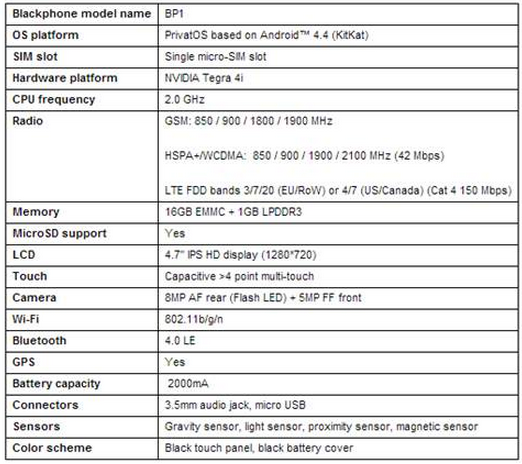 Below, the company gave an updated spec list for the device, allowing customers to know exactly what they are buying. We see the NVIDIA Tegra 4i processor clocked at 2GHz, LTE connectivity thanks to NVIDIA’s LTE modem, a 4.7″ HD display, just 1GB of RAM, 8MP rear-facing camera, a 2,000mAh battery, and its PrivatOS based on Android 4.4+ Kit Kat. It appears to be a nice little package, purely built on a secure mobile experience, priced at $629.99. According to the company, devices will begin to ship in June. If you want one, the company’s online store is open, but devices look to be sold out for now. Who here has already ordered themselves a Blackphone?